While I was at a clients house this week I was delighted to spot this lovely ship heading out of the canal. This is the Thomas G Thompson. What a treat it was to get a couple of nice photos of it. It reminded me of the year I was a stringer for the local paper, writing about the events and scenery of the Hood Canal. This ship came through then, and I wrote a small piece about it. So I dug it up (all writers keep all their stuff) to attach here. It further gave me the idea to give new life to those articles here on New Pioneer! So in the coming weeks and months I will sort through them and share with you. So for this weeks post, here is the article I did on this pretty little ship. 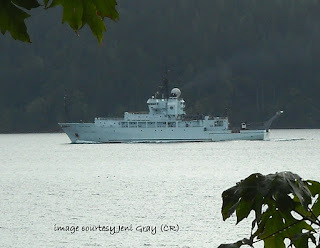 Monday morning, October 25th, the R/V Thomas G. Thompson could be seen cruising through the Hood Canal on calm waters. The University of Washington’s School of Oceanography students were collecting sediment samples as part of an undergraduate program being conducted by Professor Rick Keil. Oceanographer and Manager of Oceanography Technical Services, James R. Postel, said the students were also collecting water column samples and learning how to analyze for dissolved oxygen. “Hood Canal is of great interest to the students because of the well publicized low oxygen levels often encountered there.” He added. Owned by the US Navy, and part of the University-National Oceanographic Laboratory System fleet, the 274-foot vessel was built for the sole purpose of implementing scientific research and is operated by the School of Oceanography, University of Washington. Funding for the ship time is provided to the School of Oceanography for student teaching support by the state. Mr. Postel says the vessel will be leaving Hood Canal Tuesday morning and returning to the UW. Another group of students will be taking part in a similar cruise near Edmonds at the end of the week.